Beth and Priscilla were at the studio for some sewing time one day last week. Carol Altemus, who started her jacket in Priscilla's class in March, stopped in for some fitting advice from Priscilla. Here's a better view of her jacket, which is looking good even in its rough stage. Beth was putting binding on her Sunset quilt, which I believe is to be shown at the Genesee Valley Quilt Club June 3, 4, and 5. And today Priscilla, Beth and I had our final committee meeting for the Project Iron Quilter contest that will be held on Saturday, June 4th, at the GVQC quilt show. Genie Barnes joined us, and she will be serving as our judge. Beth brought the parts of the turquoise jacket she's working on and completed these pieces for the sleeves. The center strips of embroidered panels came from one of Priscilla's trips. The wild and wonderful wisteria covers the gazebo behind the horse barn. Some serious early spring trimming allows entrance to a circular seating area and welcome shade. Some iris rescued from the hillside that was dismantled for the studio prosper in their new spot. They make wonderful cut flowers, and a nice bouquet came indoors to be viewed at the dining room table. The flowers for drying will soon be planted in these oval beds visible from the deck and many southern-facing windows in the house. Preparing the beds is always a lot of work. Our neighbor, Bill Elmer, mows the back yard, with the studio and in-law apartment in the background. He has been our steady helper for almost 30 years. We had our lawns treated for broadleaf weed control, and an applicator estimates we have over 75 thousand square feet of property that we mow during the season. A new light-weight tiller was a welcome birthday gift for Marcia. She is very happy to join the big Troy-Bilt tiller that Bill uses in the vegetable garden. The newborn fawn was routed from its hiding place as the front pasture was trimmed by our rotary mower. The three-foot tall grass was cut, and fortunately the baby moved out of the way in time. 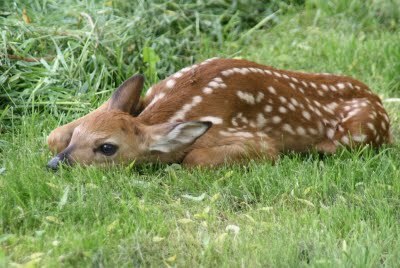 Fawns of this age are often taught to stay motionless and quiet. They have no heavy scent and are safe from wandering coyote and fox. Later in the day the little baby was gone, and we assume Mother came back to pick him or her up! 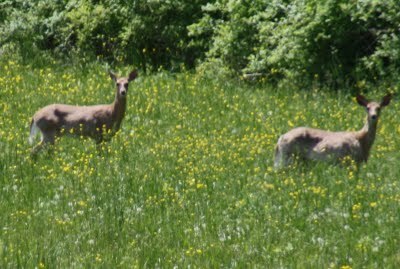 Our old horse pasture has been taken over by resident deer herds. A couple of regular visitors are watching and checking on Beth, as she photographs them. Beth thinks at least one of the does, if not both, is pregnant. What do you think? We also have a resident pair of Canadian geese and their four goslings on the pond along the driveway between our two barns. They will stay until the babies can fly, which will take a few weeks. Our other regular resident is the pretty skunk who hunts for grubs in the morning and early evening. She has a regular route which brings her path close to the house. This critter mostly ignores the humans, and we certainly do not try to intrude on the important food-hunting business. Inspector Suki kind of enjoys all the activity, but so far, has not intruded on the presence of the larger animals. We have to be careful, as with only mild encouragement, she will chase the skunk. We keep waiting for her to learn a painful and smelly lesson! PAQA South (Professional Art Quilter's Alliance - South) is sponsoring "Art Quilts - movement", their 9th annual juried exhibition of innovative art quilts. It's currently on display at the Durham Arts Council in Durham, NC. Nancy, Jeanne, and Priscilla are all working on new projects. Linda showed us two pieces: The one on the left was started in Terry Jarrard-Dimond's "All About Shape" class. And the one on the right she developed from fabrics she made. Bev was adding the top and bottom sleeves for her new quilt that will be in the Parallax Exhibit, May 31 to June 25 at the Booksmart Studio in Rochester, NY. Nancy is working on the background for a new piece using some African fabrics. And Priscilla is starting a new leaf quilt. This is the start of my new Jet Trails piece. We've been getting regular visits from this pretty critter. She travels a regular route from the barn, around the backyard, and in front of the studio. She seems to be around early in the morning and again in the early evening. I would have liked to open the studio to get a closer, better picture -- but didn't dare! Suki was on the inside of the studio door looking out, when our visitor looked in. And then she went on the rest of her rounds. Suki decided to stay inside and be contented with making a nest in Priscilla's plastic bag. I'm pleased to announce that Jet Trails #5 has been accepted into the SAQA (Studio Art Quilt Associates) exhibit, Structures in Cloth, which will be seen at three venues in Colorado. The exhibit will open in June at the Arvada Center for the Arts and Humanities in Arvada. Then it will travel to the Sangre de Cristo Arts Center in Pueblo, and then to the Fort Collins Museum of Art in Fort Collins, finishing in April 2012. The jurors for the exhibit are Sandra Sider and Bebe Alexander. The tulip tree doesn't keep its blossoms for very long. We have tulips around the trees again, after figuring out that the little white fences seem to be enough to discourage the deer from eating the plants before they even form flowers. Our two hosta plants off the deck are just starting to come up. The metal hoops are at the ready, in case we find evidence of the deer coming this close to the house. In the perennial gardens, though, we know the hostas won't get very far once the deer find them again. So we have placed the metal hoops with black plastic netting to cover the plants. Our big garden tractor is still in the shop for its spring tuneup, and our little garden cart has been pressed into service to carry away the branches and weeds that are accumulating from the start of the spring cleanup. The red raspberry bushes -- in the midst of their spring cleaning. There are still some old canes that need to be removed and always more weeds to remove. Suki's idea of helping is to keep us company by taking a nice long nap. The Wayne County Council for the Arts is hosting a "Month of Quilts" exhibit at their facility in Newark, NY. The purpose of the exhibit is to recognize and encourage the appreciation of contemporary quilt art by Wayne County artists. The opening reception was this afternoon, and I presented a trunk show of several of my quilts. On Saturday, May 21, Caris Burton will be doing a wearable art trunk show. Two of my quilts (on the right in the picture) are in the exhibit. On the left is Earthquake Compression and the right is Receding C's. The quilt on the table is one my mother made in the 1930's from blocks she embroidered. This view of the exhibit includes another of my mother's quilts on the table, a dresdan plates pattern.